I had plenty of reasons to be wary of Studio Deen’s umpteenth foray into the samurai genre, Kanetsugu to Keiji. Their previous offerings in that area (Hakuouki, Hakkenden) have been bishonen-centered, heavy with pandering for sales and light on interesting characters. So I was pleasantly surprised when the show opened with a rather unattractive man with a chiseled face taking an axe to a pillar for reasons having to do with ancient Japanese ethics. 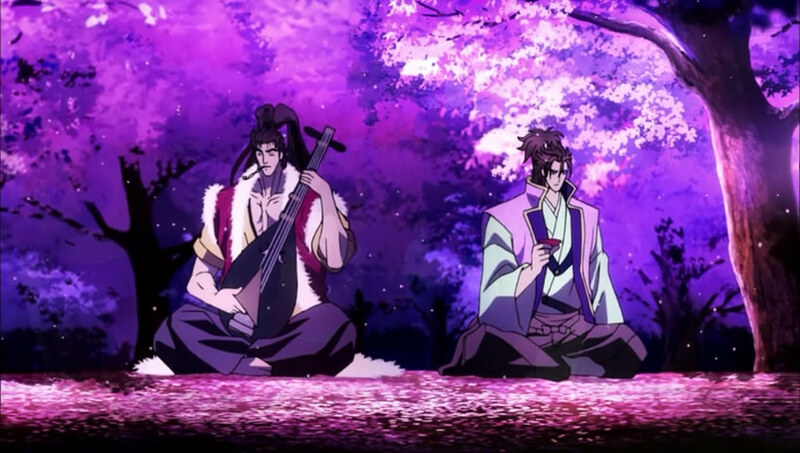 This show got sillier as it went on, climaxing in a few minutes when one of the two lead guys playing the biwa so well he made cherry blossoms appear, only to then use the biwa pick to slash down multiple assassins. Kanetsugu to Keiji definitely felt like a poor man’s Kazuo Koike series with its mix of tough guys and down-to-earth feudal Japanese philosophy. Which is still something well within my strike zone. I’m watching 3 more episodes at a minimum, and am more likely to blog it than not. It would be easy enough to criticize Brothers Conflict for being a gender-swapped Sister Princess ripoff, as most of the himawari douga commenters did within one minute of runtime. But that would be ignoring some of the bigger and more pressing flaws behind the way the first episode was set up. Much of the early episode was taken a bunch of character intros, written as infodumpy monologues and read by a not-particularly-likeable squirrel, violating the principle of showing rather than telling in a particularly grating way. Infodumping is even less cool when it happens in a show without its own terminology dictionary. Out of a male cast of 11, the only guys introduced through their actions were the one who hugged the female lead, the one who punched said guy, and the idol who showed up on TV. This approach also fell into the trap of characters talking to each other but not dialoguing because one of them is an animal, something Dog and Scissors yesterday was able to avoid. Most of the drama was based around the female lead belaboring the point that she’d rarely been with family before, something that could have been better accomplished with 5 seconds of flashback and 2 seconds of body language rather than 60 seconds of monologue. Part of me being mad at that might be just the fact that I’m a minimalist who loves compressed storytelling, but most of this episode felt like a waste of space. That’s something an introductory episode, the one most people watch and the biggest deciding factor in whether or not viewers continue a show, is the absolute worst place for. Brothers Conflict was an easy show to drop. This entry was posted in Uncategorized and tagged Anime, Brothers Conflict, Dog and Scissors, Feudal Japanese Philosophy, Introduction does not mean infodump, Introduction Episodes, Kanetsugu to Keiji, Kazuo Koike, Sell Me in 20 Minutes, Silliness, Studio Deen, Summer 2013, Summer 2013 Anime, Technical Rants by torisunanohokori. Bookmark the permalink.